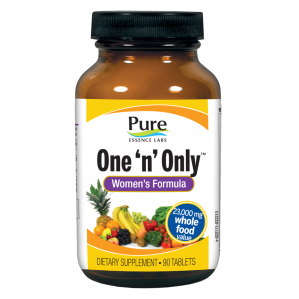 One 'n' Only™ Women's Formula is for women in reasonably good health, who eat at least a reasonably good diet. It is a perfect choice for women who simply can't take more than one tablet per day, providing not only general nutrition, but also potent factors that support breast and bone health. While we can't get as much nutrition in one tablet as we can in two or three or four, we can promise that no other one daily comes close to the power packed into these one per day formulas. A convenient, high potency one-a-day formula for less than 50 cents a day. Co-enzymated B vitamins come in their activated form; easily absorbed, ready to use. Provides mother nature's natural sources of Vitamin E, such as Gamma Tocopherol, which may be even more powerful than the more commonly used alpha tocopherol. Enzymes to assist in the breakdown of proteins, carbohydrates, starches, cellulose, lactose, fats and sugars, which lessens the burden on our digestive systems and conserves energy for our bodies. Provides a wide array of energizing vitamins and minerals as well as anti-oxidant protection, immune and liver support. A unique blend of specific ingredients designated to support bone density, help alleviate the symptoms of PMS and support the female reproductive system. Beta Carotene converts into Vitamin A in the body and eliminates any toxic build-up. Aids in calcium absorption and is vital for healthy bone development. Supports the immune system. An important component of brain cell membranes that has been observed to help with mild memory problems associated with aging. Supports the cardiovascular system, brain, liver and nervous system. A flavonoid antioxidant that protects the liver cells from toxins. Provides mono and polysaccharides to support efficient immune response. A highly absorbable form of iron that does not cause constipation or stomach upset. Provides a wide array of anti-oxidant protection for the joints, brain, skin, eyes, liver, immune & cardiovascular systems. Suggested Use: One tablet daily, preferably with breakfast.